Baptism is the act of the whole church which speaks before the world that God’s love claims us by name. Baptism proclaims our truest identity. Baptism also declares our essential vocation. 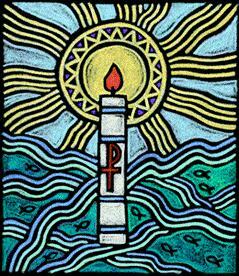 Today we will reaffirm the promise of our baptism, remembering who we are and who we are to be. There is compassion here, for broken hearts. There is grace here, for shattered lives. yet we often forget that we are your beloved. We confess that our love is fickle and inconsistent. We are sorry and we want to change. and bless us with your peace. Words and melody © 1985 by John Ylvisaker. Used by Permission. This arrangement © 2010 Lorenz Publishing Company, a division of The Lorenz Corporation. You are invited to joyfully come to the table, the welcome table. All are invited and welcomed. Participants in Today’s Service: Pastor: John Hilley; Music Director: Nate Strasser; Liturgist: Ed Vasilevskis; Guest Musician: Briana Tyson. This Week in Children's Worship: This week we will hear the story of Jesus' baptism and talk about what baptism means for us! Come celebrate that each of us is a Child of God! This Week in UPWARDS: This week we continue our study of the sacraments, symbols, liturgy, and music of worship. We will hear the story of Jesus' baptism and talk about why baptism is one of our two sacraments. We will celebrate that God loves us and that we are all part of His family! Presbyterian Women is on Friday, February 2nd at 9:30 am. They will be studying lesson 5. Everyone is welcome. They will be serving Room In The Inn at the church on Tuesday, February 13th. If anyone is interested in Patricia Hart Society’s HeART to Heart luncheon for United Way on Friday, Feb. 9th, please contact Martha Wolfe at bmwolfe50@aol.com. Member Directory Updates for the New Year: Did your address change in 2017? Please send us any updated information or new pictures so we can update our Member Directory for the new year. Please send them to Doug in the church office by emailing him at dhausken@ebpctn.org. Thank you! Chloe Glover spent the holidays in the hospital. She is resting at home now aiming to get her energy back. It will still be a couple of weeks before things get “normal” at their house. The family could use our help by offering a meal for them in the coming weeks. To sign up please go to: https://mealtrain.com/yl9zvl. THANK YOU FOR YOUR SUPPORT! We are very grateful to everyone who gave so generously during 2017. Many of you fulfilled your pledge for the year which we are certainly grateful for, and several more even reached a little deeper to exceed their pledge amount for 2017. With your generous support, we were able to close out 2017 with a much smaller deficit than we expected. And now, we can look to 2018 to continue to provide you and your families with a vibrant worship service, outstanding music and children's programs as well as our many fellowship activities we have planned. † Chloe Glover who is home recovering.